It seems to be a written rule that gym memberships are costly things, especially when you’re more likely to skip a workout than actually attend it. For those of us on a tight budget and eager to work out, however, it can be frustrating knowing just how much we have to pay out just to get on a treadmill or lift some weights. While it’s possible to take out a payday loan in a financial emergency, our fitness regime requires alternative funding and so you’ll be pleased to know there are plenty of ways to build up a decent regime without having to pay out very much at all. To find out how, read on! Multi-use equipment is a great way to get the most out of an investment. A lot of the fitness equipment on the market today is generally designed for one part of the body or for single use, but there are plenty of alternatives to help you make the most of your money. You could opt for an exercise ball that’ll help you work your abs, or support you during other training or cardio exercises. Steps are another purchase that many exercise lovers opt for when on a budget, giving you the opportunity to work on your legs, cardio, and, if large enough, can even be used as a weight bench. There is more around your home available to use for exercise than you may think. From filling up empty milk cartons or water bottles and using them as weights, to using your staircase as a single step or move up and down them in ‘laps’, there is certainly no shortage of things you can do. You can do all kinds of exercises from the comfort of your home, including dance workouts, yoga and frankly any other form of exercise that doesn’t involve equipment. Work out what you have the time and space to do at home, and build up a routine from there, without spending a single penny. There are plenty of exercise resources available for free to those who look for it. Your local library will probably have plenty of books about keeping fit and healthy, or you could take to the internet for exercise videos, different training suggestions and in some cases, free exercise and weight-loss programs. Another option is to take a look in your local area and see if there are running or walking clubs you can join for free. Some of these might have an annual fee, but they often aren’t too expensive and are likely to be cheaper than joining your local gym. Personal trainers are great for those that can afford them, but for some of us, that cost just isn’t one we can stretch to. However, training with a partner is a valuable asset that can help to motivate you in a way you may not be able to replicate when exercising by yourself. By training with a friend or family member, you’ll have someone right there beside you as your spotter during the more difficult exercises and can also motivate you through the tough times. You can exercise together and then celebrate together when you reach your goals, what’s not to love? If you really need motivation to get out there and exercise and a cheap way to do it too, then why not set a goal of running 5k? Of course, we aren’t expecting you to jump up right now and be able to run that distance, but by training yourself to run a little further every day, you could be reaching those distances in just a few months. There are plenty of couch-to-5k regimes that you can sign up to for free, or women could opt for running the Race For Life. This 5k run is in aid of Cancer Research UK, so not only are you getting your fitness up, you’re also working towards a worthwhile cause. Getting fit doesn’t have to be a costly experience. You don’t need to sign up to the gym to start shedding the pounds when there are plenty of alternatives right there to choose from. Whether you opt for training for a 5k run, or you simply do a little more exercise about the house during your day, incorporating the above techniques into your routine may help you to build up a regime with ease. Good luck! 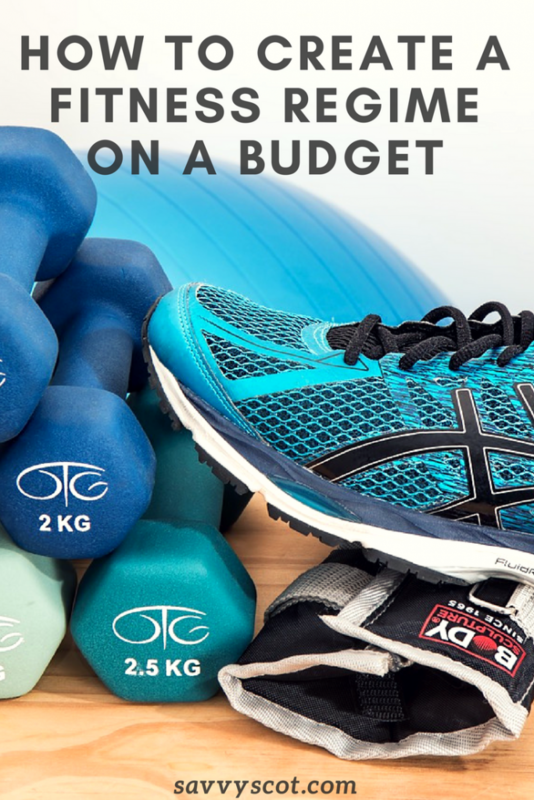 I’m really into creating a fitness routine at the moment so these budget tips are perfect – thanks! Resistance bands and bodyweight workouts. I started this last year not just to save money – it’s also a lot safer. I used to lift weights pretty much everyday until I had a really bad spine injury. I am an average short guy with a big belly. I got family business to handle. I was not able to arrange the time for my workout. Finding the time and motivation for my workout was my biggest struggle in terms of staying fit, and I appreciate the above tips for overcoming that. Some of these tips, such as picking Out Some Home Workouts, were ones I hadn’t thought of. Picking Up Multi-Use Equipment has been explained really well it would be great to hear more about common fitness challenges and some carefully guiding tips for avoiding stupid injuries.